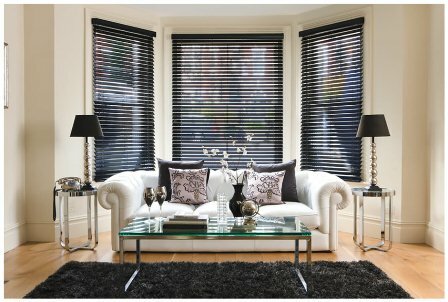 Our Wooden Venetian Blinds range are modern, contemporary, affordable and come in a variety of colours. They are excellent for maintaining privacy – tilting the slats lets you control the amount of light you let in but keep your room out of sight. Traditionally Wood venetian blinds were popular in wood stain finishes, and whilst still available, painted creams, whites, greys and tauped coloured wooden venetian blinds are now the popular choice. 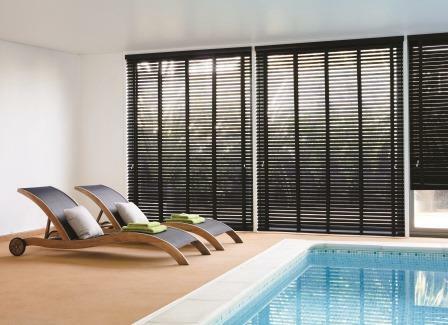 Signature Blinds has a carefully selected range of natural wood venetian blinds; choose from dark wood to lighter shades and painted finishes, all available in a choice of 4 slat widths, 25mm, 35mm, 50mm and 63mm. Our customers can choose to have their wood blinds in a high gloss, distressed or veneer finish. With this stylish wood blind we have a variety of fabric tape options, plus eight new metal pull tassles in fashionable finishes. Our range comes in 35 slat colours including natural wood and painted finishes, colour co-ordinated headrails, cords and ladder braids aswell as matching valance. All our blinds come with cord consolidators for child safety. Our Wood Venetian blinds are available up to 242cm wide, and are made from timbers grown in environmentally friendly and sustainable forests. These made to measure blinds are easy to use with a choice of control options. Buy your Wooden Venetian Blinds from Signature Blinds as they are the perfect way to create a warm, stylish and natural look to your home.